In part 1 of this two-part series, yesterday I'd written about what discernment is, and that there is discernment as a skill that all Christians are to train themselves in (Hebrews 5:14), and discernment as a gift of the Spirit given to some. (1 Corinthians 12:10). In this final part 2, we look at how the gift of distinguishing of spirits is supposed to work. One might think from the mushrooming of discernment blogs lately that all the discernment folks do is go around crying out all day like the Monster Shouter in the movie The Stand. Not so. Speaking is the very last thing a discernment person does, after first employing other steps (This is in my opinion, developed from experience. Your mileage may vary). 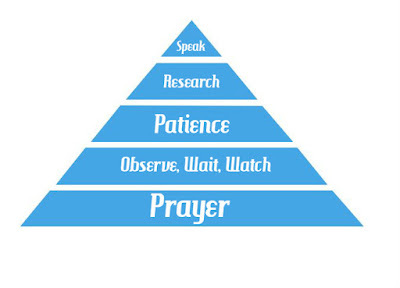 First, if a person has the gift of discernment, its employment should always be paired with prayer. One's initial response before employing the gift (or any gift) should always be to pray. Daily confessing one's sin and being submitted to the word is important because this tunes a person in their walk. Then, if you have a discernment concern, don't make a move without prayer. Discernment is a gift from the Spirit and thus, the Spirit operates it in the person's life and for the betterment of the Body. So pray to the Spirit in the Spirit! Next, I observe for a long time before making a move. I wait on the Lord- maybe the prayers will be answered and the situation resolved without further action. Maybe the person will repent, or see the light. I wait because the Lord might want to use another discernment person int he church and not me this time. I wait because I could be wrong. Being a trigger happy discernment person would confuse things and be a poor witness for Jesus. The next step I employ is to be patient while all this is going on. I keep it to myself, or touch base with one mature person outside the situation to ask them to pray for me. Then I wait some more, patiently. Picture discernment people standing alone at a high forward outpost, watching over the military field for invaders. Or on a Forest Fire tower watching out for the flame. 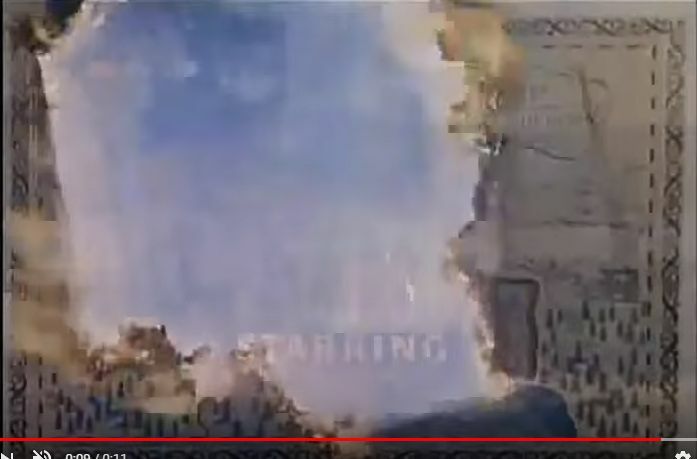 You can see the invaders or the flames much earlier than can the people busy down in the fort. You sound an alarm, like "They are coming, they are on the horizon." Or, "the flames are getting closer." If your church had observed you and confirmed you have the gift, they will listen and take action. Others, sadly, will not listen to you until or unless they can see the flames, but by them often it's too late, a lot of damage has been done. 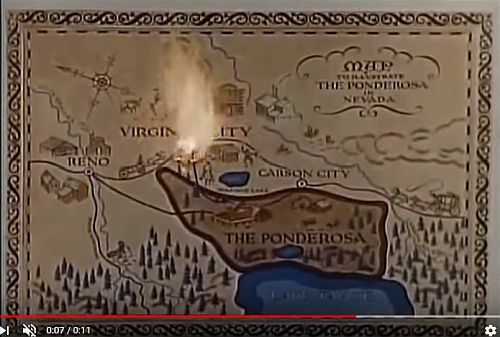 In the old TV cowboy western show Bonanza, (1959-1973) the opening credits featured a map of the ranch. This is a piece of Americana. 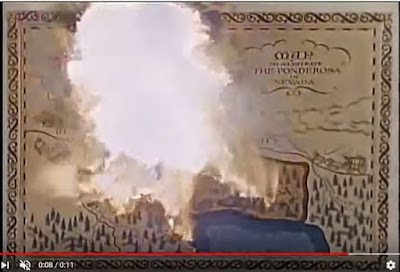 Then in the middle of the map you see a small flame, then quickly it grows and destroys the map. In the church, the flame is some sort of sin, moral or doctrinal. It's that the elders overlook divorce in its members, or one of the leaders is having an affair, or the pastor holds to a form of contemplative prayer. It's that an influential female is giving copies of Jesus Calling to friends, or that the youth are hosting an IF:Gathering Local. These might not even be known or visible yet, but the person gifted with discernment will sense it. Sin grows and destroys. Left unaddressed, it will burn through the church, taking members in its wake. between spirits can sense it. Uh-oh, discord and division happens. Chapters 2 and 3 of Revelation are relevant to today, recording Jesus' displeasure over tolerating lying prophetesses in the church, allowing false doctrine, being busy without love for Jesus, coasting on reputation, or being lukewarm in faith. The discernment person warns, exhorts, suggests, having seen and sensed the false prophetess early, the false doctrine when it crept in, the cooling of fervor, and so on. I was a new member of a church once, where the pastor was very popular and had been at his post a long time. The church was growing in leaps and bounds. Yet I was distressed after hearing the sermon every week. I was disquieted in my spirit. I seemed to be the only unhappy one around. Discernment work is often lonely. Each week my mind kept nagging that the sermon was 'empty' or as Gertrude Stein famously said about the city of Oakland, "There's no there there." I prayed for the Spirit to help me discern what was happening. Was my disquiet on my side, being unsubmitted, sinning, or displaying an unholy discontent, or did my disquiet have a moral or doctrinal basis? Eventually the agitation grew to an unbearable level. This is where I moved beyond prayer, waiting, and patience, and entered the research stage. I googled some of the pastor's main points and quotes. I compared to the Bible. It turned out that he was plagiarizing other sermons word for word and had been for at least 4 years before I got there. Some of the sermons were from Joel Osteen and Rick Warren. No wonder the goats were filling in the church, there were goat words issuing from the pulpit. It was the Spirit's gift of discernment that graciously allowed me to hear the emptiness behind the words. There was no truth to them because they were from a different spirit. It was His mercy that kept nagging at my mind and heart until the critical mass was reached. However I did not go forward based on a feeling. I prayed, researched, compared to scripture, and discovered that the words from the pulpit were lies from other liars. Jeremiah 23:30 addresses pulpit lies, false prophets stealing words from each other, and claiming they are from God. It was then I brought my information to an elder. The men took it from there. Once delivered to the men, my part as a person employing the gift reverted to the prayer level. I prayed that they would do the biblical thing in a biblical way. It's admittedly difficult as a woman with the gift of distinguishing of spirits. I need to be bold but humble, strong but meek. In this scenario described above, my role would not be to go all around to other members speaking and proclaiming what was going on behind the scenes, mounting up allies. It would not be to pressure the men. It would not be to confront the plagiarizing pastor. Instead, I prayed for the elders and deacons (and the pastor). Anyone employing the gift should employ it humbly. It would be a terrible thing that instead of using the gift in proportion to our faith as Romans 12:6 advises, to go forward in incomplete information, pride, or bias. Always, scripture says that the gifts are to build up the body. An individual training themselves up in discernment uses discernment when they hear a sermon or chooses a book. Those with the gift of discernment use it for not just themselves but the local body to build it up. A person with discernment relies on the word of God. Test all things against the word, (1 Thessalonians 5:21; 1 John 4:1). A believer with the gift of discernment is accountable to God for its use. Pouring Bible into one's mind and heart is the best and only way to ensure that when a counterfeit comes along, the discernment person will be able to detect it early and certainly. And, prepare to operate the gift in loneliness. Everyone loves the woman with the gift of mercy. She brings cake. She comforts. The discernment person lol, not so much. She brings distress. "What do you mean that the book I'm carrying around is authored by a different spirit? I love that author!" And they edge away from you in the pew. It is all worth it though, if your discernment work builds the body, if it fulfills your ministry, and if it honors Christ. Again, as with every spiritual gift, honor Christ with it. This is fantastic! I'd say in your discernment, you also possess the gift of exhortation. As is evidenced by the clarity and soundness of posts like this. I love how you broke down the steps of using the gift of discernment, because this is how my husband and I also have handled it. 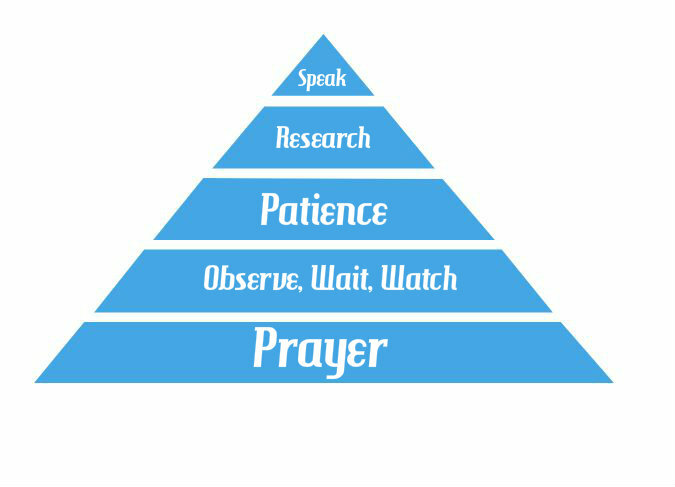 We start with much prayer, patience, research, and then we speak when prompted by the Lord, always to the leaders, then we return to prayer. Sometimes speaking is required more than once. I also agree, there should be no place for behavior such as running around to all the rest of the body to start a coup or anything of that sort. Discernment should be addressed with wisdom, to the leadership, for that is whom God has ordained to handle doctrinal and polity matters in a local assembly. That is why it is a sad and frightening thing when leaders do not listen to discerning believers. In doing so, they are stifling the Spirit, refusing the counsel of the Lord, and thus they propagate error, ultimately causing harm. "Shoot the messenger", rather than root out error, sadly often is the result when discerning believers attempt to speak. Your analogy of the small flame vs the full fire is absolutely on the mark. What's easier to put out? A little isolated flame, or a roaring forest-fire inferno??? Oh that the local assemblies would heed the warnings of those who see the tiny flame, and snuff it out. "And, prepare to operate the gift in loneliness. Everyone loves the woman with the gift of mercy. She brings cake. She comforts. The discernment person lol, not so much. She brings distress." LOL, yup. I do believe discernment might be more detested when it's found in women, because we're supposed to be "nice". Sadly, though, the unwelcomeness of the gift is also true of men. The man with discernment is equally unwelcome, for he, too, brings distress. He doesn't conform with the crowd, or accept a position as a "yes man". He doesn't live as a pleaser of men, but as a pleaser of God. He stands on the Word, often at odds with everyone else around him. Like a previous blog you posted, about going against the current... often discerning believers have to do that very thing in their own local assemblies. Going against the current even in the body of Christ! It can be a painful, lonely road. And as an aside, I remember burning in anger at a sermon once, where the pastor was condemning a sin. He was speaking correctly of the word of God, but something about his speech made me fume internally. It was revealed a short while later that he had been committing the very sin he had been preaching so strongly against (and, in that sermon, condemning others who did it). It was his hypocrisy that I could sense in the Spirit, though I couldn't pinpoint it immediately. Not until God revealed what had been hidden.